In 2007, Amma asked that a 1000 fruit trees be planted at MA Center, San Ramon and thus, GreenFriends Farm was born! Today, with rolling hills of fruit trees, GreenFriends Farm has blossomed into an educational center for ecologically conscious agriculture. It is a destination for enjoying nature, and a vibrant spot for volunteers of all ages. The farm is a place to grow with Nature. Using the guiding principles of permaculture, and utilizing Soil Food Web technology, our goal is to shift the way we work with the earth. 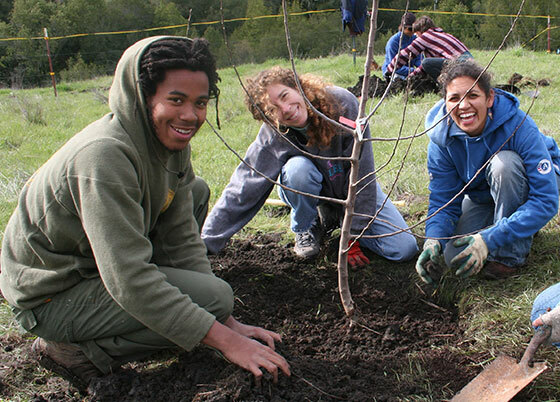 GreenFriends Farm works in collaboration with Common Vision to offer hands-on courses and intensives on ecologically conscious farming and land management practices. 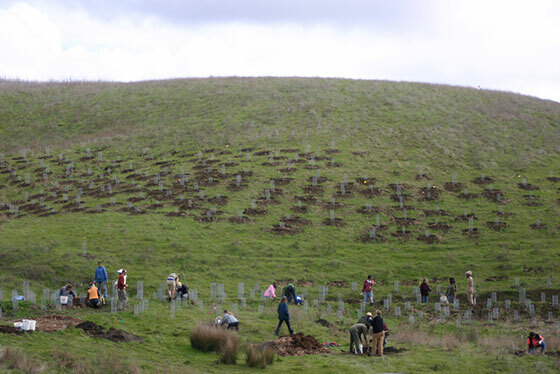 On volunteer days we host groups and permaculture enthusiasts who come to help prepare the soil and plant trees on the farm. Our outreach to local schools provides an experience of nature and farming systems to urban youth and their families. Permaculture is a design science that creates living environments that are sustainable and have the diversity and resilience of nature. GreenFriends Farm hosts a Permaculture Design Certification Course in cooperation with Living Mandala. 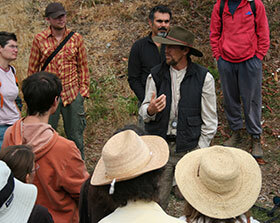 The farm is also a hands-on classroom for the San Francisco Permaculture Design Course. Soil Food Web is a science of soil microorganisms and their interaction with plants and the earth. We are using Soil Food Web techniques to transform our hard clay soil that is bacterial dominant into a fungal dominant soil that is suitable for fruit trees. GreenFriends Farm is honored to host Dr. Elaine Ingam’s Soil Food Web course every year. Dr. Ingam is the chief scientist at Soil Foodweb Inc. a premier research institute for organic farming since 1947. Join our mailing list to keep posted on latest courses and volunteer dates. If you are interested in sponsoring courses, events or farm activities, please contact us to learn more about partnership opportunities.